Building on the successful 2016 Upstate Regional Summit: Creating a Leading Region, Ten at the Top is pleased to announce its 2018 Upstate Regional Summit – “Winning the Future” – will take place on Thursday, September 25 at the TD Convention Center. The 2018 Summit will provide a unique opportunity for business, community and civic leaders, as well as interested stakeholders from across the region to share ideas and discuss how to work collaboratively to ensure the Upstate region continues to enhance the economic vitality and quality of life for all residents. “Ten at the Top is an organization that is focused on redefining our future as a collaborative Upstate,” Sue Schneider, Ten at the Top’s Board Chairman, said. “But a future to match our vision requires lots of work in the present tense. We’ve named our next summit ‘Winning the Future’ for that very reason. We’re focused on success and the work we must do today to achieve our vision for tomorrow. The 2018 Upstate Regional Summit, presented by Blue Cross and Blue Shield of South Carolina, begins with a morning panel session: “Is South Carolina and the Upstate Well Positioned to “Win the Future’ in Economic Development and Job Creation?”. The Summit will continue with breakout sessions involving presentations by and discussions with Upstate leaders through the lens of Ten at the Top’s five Regional Driver areas: Winning the Future Around Education & Workforce Development, Winning the Future Around Mobility & Connectivity, Winning the Future Around Innovation & Technology and Winning the Future Around Creating Vibrant Communities. The Summit will culminate with the Summit Keynote Luncheon. Ten at The Top is excited to welcome Polly LaBarre as the 2018 Upstate Summit Keynote Speaker. Polly LaBarre is the Co-author of Mavericks at Work, Co-founder of Management Lab and Founding Writer at Fast Company. For more than 20 years, LaBarre has used her writing, business consulting, and speaking to help organizations unleash and organize human potential in ever more powerful ways. As co-founder of the Management Lab, a “think-and-do” tank dedicated to rebooting management for the 21st century. Along with her partners at MLab (pronounced “M-Lab”), Polly has developed a pioneering method and platform for changing how large organizations change. They run large-scale, real-world experiments in “hacking management” to build the deep organizational capabilities crucial for thriving in a creative, disruptive world: adaptability, innovation and inspiration. Polly has traveled the world to study and work with the courageous contrarians, management mavericks, and pioneering progressives who are inventing the future of organizations and business. Early in her career, Polly was part of the founding team of Fast Company magazine. There she played a central role in the remarkable success of a magazine that recast the conventional wisdom on power, competition, work, leadership, innovation and change. The magazine introduced the world to a new universe of organizations and leaders whose management models were as distinctive as their business models were disruptive. Polly is the co-author of the award-winning book Mavericks at Work: Why the Most Original Minds in Business Win, which was a New York Times, Wall Street Journal and BusinessWeek bestseller. Published in over 20 territories, Mavericks was a “Business Book of the Year” for the Financial Times, the Miami Herald and The Economist, which called the book “a pivotal work in the tradition of In Search of Excellence and Good to Great.” CNN, CNBC and GMA all created series around the book. Polly’s writing has appeared in a variety of publications, including Fast Company, The New York Times, the Wall Street Journal, Harvard Business Review online, Fortune.com, the McKinsey Quarterly and she has served as business and innovation correspondent for CNN. The 2016 Upstate Regional Summit brought together more than 850 community and business leaders from across the Upstate in a sold-out event sponsored by more than 45 organizations to discuss key issues impacting current and future growth and the importance of regional collaboration. Ten at the Top expects the 2018 Upstate Regional Summit to draw a similarly large attendance, participation and support among Upstate leadership. Sponsorship opportunities are currently available for the 2018 Regional Summit. A table for ten at the Summit is available for $750. A table for ten with added exposure in the Summit’s networking expo is available for $1,250. There are additional exclusive sponsorships available at various pricing levels. All questions and inquiries regarding sponsorships can be directed to Caroline Gross at sponsor@tenatthetop.org or by calling 864-360-1015. Individual Summit tickets will be available for purchase beginning in July based on available space. Due to past demand, Ten at the Top encourages organizations and individuals with a desire to get involved to commit early. Seating at the Summit is limited, so to guarantee tickets, TATT is encouraging companies to join as a sponsor. The sponsorship deadline is June 30 to be included in major Summit print materials. As the next step of the Connecting Our Future initiative to develop a regional vision and actionable strategies for enhancing mobility, transportation and connectivity across the 10-county Upstate region, Ten at the Top is inviting interested stakeholders to share their ideas during the Connecting Our Future Idea Exchange. The workshop is being held on Monday, March 19th from 1:30-4:30 pm at the Michelin Conference Center (517 Michelin Road, Building 18, Greenville, SC 29605). Born from the Shaping Our Future Growth Scenarios Analysis, Connecting Our Future was launched last fall as a collaborative effort to bring together the various organizations, businesses and local governments who have been working individually on some component of moving people and goods across the Upstate. The Connecting Our Future partners have contracted with Kimley-Horn to create a regional vision and actionable strategies to enhance current and future mobility in the region. The Connecting Our Future Idea Exchange will be an opportunity for interested residents and community leaders to share their ideas and insights around a number of topics related to mobility in the Upstate. The topic areas include: commuter travel, bicycle & pedestrian, transit, freight movement, workforce access, strategic infrastructure, land use & development and innovation & technology. 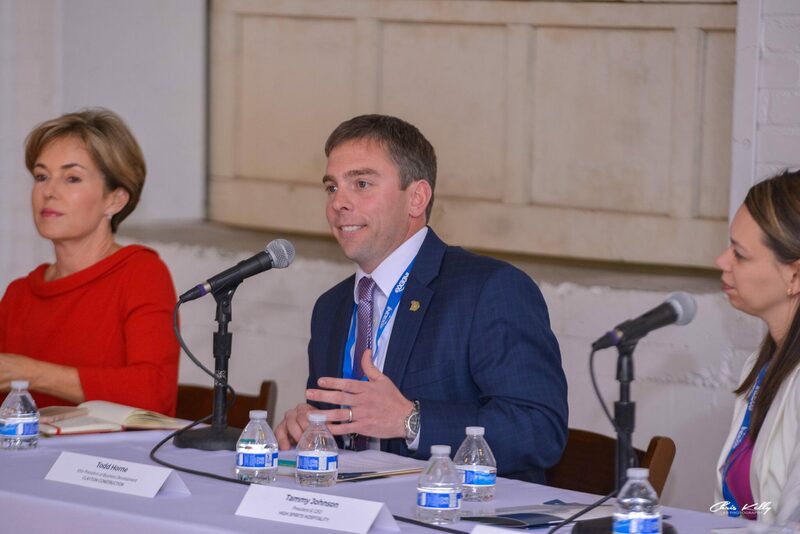 “When we first convened stakeholders around transportation and mobility, it was quickly recognized that everyone is working on important elements of moving people and goods across the region, but that most work was being done in a vacuum when in actuality there was an opportunity and need for greater connectivity and collaboration,” said Dean Hybl, Executive Director of Ten at the Top. “The ultimate goal of Connecting Our Future is to increase access to transportation, reduce congestion and improve connectivity across the Upstate. However, without a clear vision and actionable regional strategies, we would continue to struggle to create clarity and synergy on how to accomplish those goals. “The Idea Exchange on March 19th is an important step in the process as we want to hear and understand the ideas and concerns of stakeholders from across the Upstate,” Hybl added. Michelin is serving as the host for the Idea Exchange and is one of four Steering Level partners for Connecting Our Future. The others are Duke Energy, Hollingsworth Funds and the Jolley Foundation. In addition other businesses, local governments and non-profits have come together to support this regional initiative. A full list of the coalition partners as well as more details about the entire initiative can be found on the Connecting Our Future website, www.connectingourfutureupstatesc.org. The final vision and strategies, along with next steps, will be unveiled later this summer. The Connecting Our Future Idea Exchange is a free event, but advanced registration is requested. For more details and to register, please go to www.connectingourfutureupstatesc.org or www.tenatthetop.org. When we think about building an Upstate region that is economically strong, good stewards of our resources and where all residents have opportunities to grow and succeed, it seems logical that creating coherence among stakeholders working towards enhancing our economic vitality and quality of life would help make each partner and holistically the entire region stronger. Certainly, when you have multiple people, interests and other factors involved, creating coherence is a challenge for any business, community or endeavor. But imagine trying to create coherence when looking at the educational and future economic success of our children. Just within the Upstate, we have 23 public school districts plus more than 20 technical colleges, two-and-four year colleges and universities and post-graduate schools and programs all supporting the educational attainment and success of their students. If you add to that mix thousands of businesses, all with their own specific employment needs, who rely on the students produced through the education system and then top it off with local and state governments and governing bodies who play varying roles in creating policies or setting spending rates, the result is a system where creating any level of coherence or connectivity can seem incredibly daunting. Yet, studies have shown that regions that have developed connectivity and collaborative opportunities that include all elements of the education spectrum are able to provide valuable experiences to enhance the overall success of the students within the region. 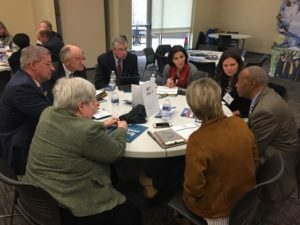 In a region like the Upstate where the educational and economic success of our communities are very clearly connected and there have been a growing number of collaborative regional initiatives in recent years, creating meaningful coherence and connectivity could provide even greater value for students and businesses across the region. 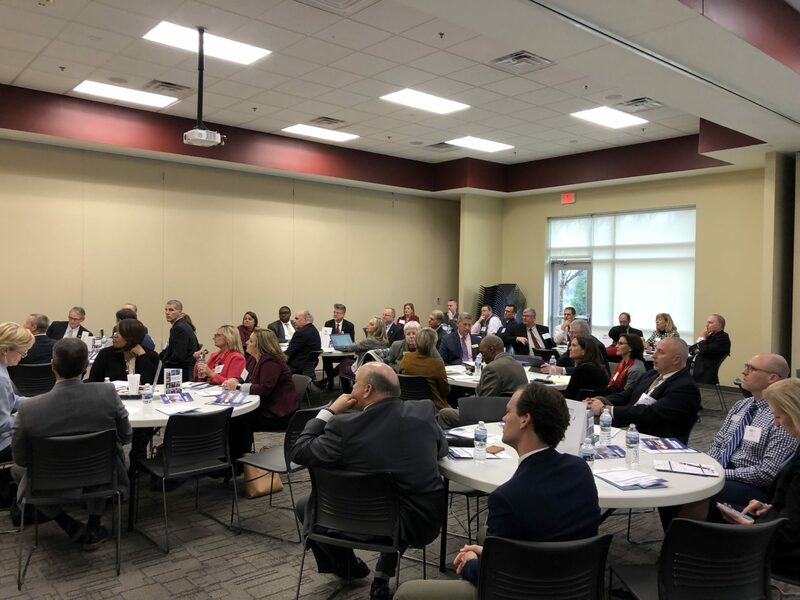 It was with this backdrop that Ten at the Top and Public Education Partners recently convened the first-ever Upstate Superintendents and College/University Presidents meeting at Tri-County Technical College in Easley. With more than 40 representatives from k-12, post-secondary education and the business community in attendance, the participants clearly recognized both the opportunities and the barriers towards creating coherence and greater regional connectivity between the k-12, higher education, and business sectors when talking about the educational and future economic success of the children in the Upstate. Fortunately, in the Upstate we have a number of individual districts, county or multi-county examples of initiatives where the various sectors within education and business have connected to create a program or enhanced opportunity for students as they move through the k-12 system, graduate high school, and move into post-secondary opportunities. The question in the room was whether we could possibly create a framework for developing similar partnerships and initiatives at a greater regional scale. • Intentional communication and dialogue is critical. It was pointed out that just the fact that this was the first-ever meeting at the regional scale of k-12 and post-secondary superintendents, presidents and provosts illustrates a deficiency and why there often seems to be a disconnect between those teaching students at different stages of their educational experience. Developing and supporting some type of consistent dialogue across the education spectrum could potentially eliminate some of the “inaccurate perceptions” that seem to currently exist among the various stakeholders as well as create a more seamless transition from one level of education to another. 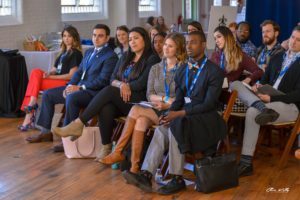 Then engaging the business community to be part of that larger dialogue would go even further in creating a coherent system that supports students through their entire path from the beginning of their education journey through entering the workforce. school districts, businesses and colleges have worked together to develop a program of curriculum that supports their collective needs. Developing a system where those collaborative opportunities can be done on a larger, regional, scale would increase productivity at all levels and also help deal with the reality that the needs of our businesses are ever-changing based on technology and other factors and our school systems struggle to adjust at a quick enough pace. • Challenges are often similar, so why not learn from each other? It was clear from the dialogue that whether it be state and federal mandates or ever-changing real-world dynamics (like student health and safety), each educational entity is dealing with many of the same issues and challenges when striving to support students. Rather than having to figure it out on their own, developing a platform for sharing of ideas, best practices and ways to address consistent issues would alleviate repetitiveness and create a greater opportunity for growing the collective capacity. Creating a culture of coherence, connectivity and collaboration across the education and business spectrums in the Upstate will not be easy or happen overnight. However, often the first step in any pursuit is the hardest, so now that it has been taken, moving towards a “unified whole” is a pursuit that I hope and believe our education and business leaders are ready to tackle. For more information about Ten at the Top’s efforts to build collaboration and collective capacity across the region go to: www.tenatthetop.org. For more information about Public Education Partners’ collaborative efforts with schools and the community to strengthen public education in Greenville go to: www.pepgc.org.